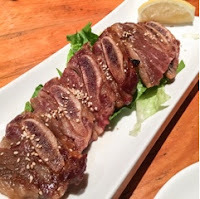 Ever wonder what happened to Guu? 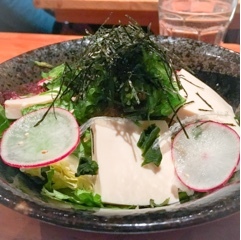 Rest assured, the chain of lively izakayas has not succumbed to the competitive Toronto landscape, but has rather morphed into Kinka. The menu is still comprised of reasonably priced shared plates, the staff as energetic as ever and the boisterous greetings haven’t disappeared. To celebrate the transformation, Kinka invited bloggers to dine on their tasting menu ($33/person for a minimum of two people). It's ideal for those who are overwhelmed by the abundance of choices and would rather trust their stomachs to the experts. All the dishes are available a la carte, hence their individual prices have also been provided in the post. Overall, the 9-course menu is well thought out with a selection of hot vs. cold, grilled vs. fried and vegetables vs. proteins choices; are still meant for sharing. Normally, I shy away from ordering salads but rather enjoyed these lighter dishes. 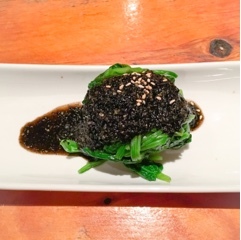 The seaweed and tofu salad ($7) certainly incorporated enough flavours with a citrusy ponzu soy vinaigrette, sweet crunchy marinated seaweed and slivers of toasted nori. Meanwhile, the creamy sesame sauce on the gomaae ($4), went surprisingly well with the cold blanched spinach – adding a salty nuttiness to the vegetable without being overpowering. It’s unclear whether the tasting menu’s ordering of dishes remains the same, but I’d suggest splitting the lighter dishes: first serving the salad and then at the meal’s midpoint presenting the gomaae to help cut through the heavier dishes and revitalize the palette. 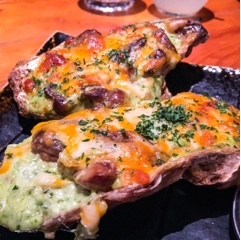 For example, the gomaae would have been perfect after having a kaki mayo ($8.50) - a large oyster loaded with mushrooms, spinach, and creamy garlic mayonnaise also covered with cheese. The oyster was hot and delicious, yet very rich, so the cool sesame spinach would have been nice to have before progressing into the meats. 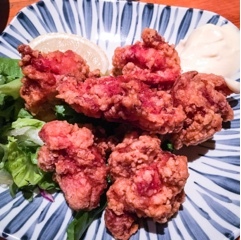 Continuing with thoughts of menu progression, Kinka should continue serving karaage ($7.80) earlier in the meal. The plump juicy fried chicken pieces marries so nicely with a cold drink. On the side is some garlic mayonnaise, but since the chicken is marinated with soy sauce, I found it flavourful enough to enjoy without the condiment. 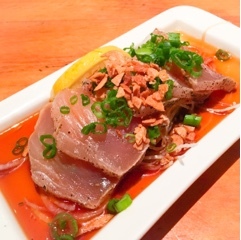 A perennial favourite of mine is the maguro tataki, thinly sliced tuna sashimi that’s lightly seared to provide contrast and dressed in a vibrant ponzu soy, crunchy garlic chips and green onions. The refreshing daikon slivers on the bottom shouldn’t be forgotten having soaked up all the flavours. 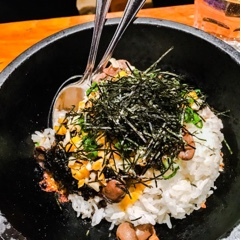 Yet, it’s the kinko bibimbap ($9.30) that I insist on having each visit – a dish that they’d likely shun in Japan with its Korean cooking methods and westernized cheese. Oh well, its aromatic seaweed laced caramelized rice smell and gooey creamy texture is so good that I don’t care. Grilled dishes being showcased on the tasting menu included karubi ($7.80; beef short ribs) and gindara ($12.80; black cod). The beef short ribs, although tender and flavourful, lacked the lovely charred grill marks and smoky essence. 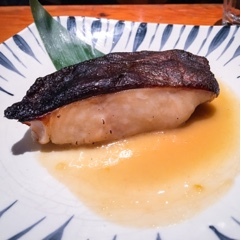 In contrast, the black cod was superb – flaky, moist and enough salty sweet miso. Best of all, the skin was crispy and left that way given the sauce was served on the plate. 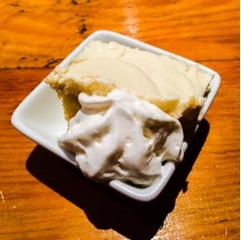 To finish a boozy slice of sake tiramisu ($6) with a crazy adult kick. There was plenty silky cheese cream and soft cookies, but the dessert could have benefited from the cookies being soaked in a sweet sauce, which would help mellow out the sake. The tiramisu was actually stronger than Kinka’s cocktails! 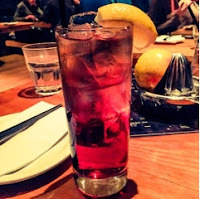 The cassis peach oolong ($7.20) and nama grapefruit were both easy going drinks sweetened with fruit liqueurs and grapefruit juice, respectively. 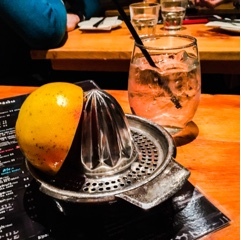 The nama does take some elbow grease as the grapefruit is served fresh and with a juicer. 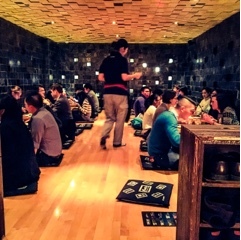 Compared to Kinka’s other locations, the Bloor one is comparably tranquil. Especially since we were sat in the tatami room away from the busy kitchen and most of the shouting. Although the room looks like floor seating, there’s actually hidden leg areas below thus feels no different from sitting on a stool. I’ll have to keep this in mind as have always appreciated the restaurant’s food, but find the constant yelling grating on the nerves. Finally, I’ve found the perfect location where I can indulge in their bibimbap while still being able to carry a conversation. Disclaimer: The above meal was complimentary. But, rest assured, as noted in the mission statement, I will always to provide an honest opinion.